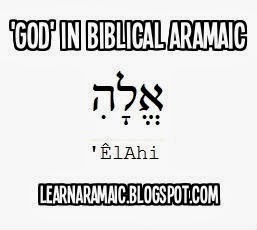 There are two words for God in Aramaic El and alaha (Syriac) or Elahi (Biblical Aramaic).The word is almost identical to the Arabic 'alah'. Here is the word Elahi with the vowels (the dots). Now let us take a look how el and alaha are written in the Syriac Estrangela script.